Hedgehogs are considered the gardener’s friend as they can help keep some of the garden pests under control. However whilst they can give us the pleasure of seeing them as they wander across our gardens late at night we can cause them a lot of problems with our gardening activities. The following advice should help to reduce some of the problems that they might encounter in our gardens. Bonfires – use a proper incinerator or move the pile to be burnt just before setting fire to it. This should ensure that no hedgehog has made a home in the rubbish. Do not burn or trim pampas grass until you are sure there are no hedgehogs nesting in it. Netting – keep all pea-netting a foot above the ground so the hedgehogs can go under it and will not try to go through it and become stuck. The same applies to tennis nets, football nets etc. Barbed wire should also be kept off the ground and never left trailing or carelessly discarded. Ponds – provide escape routes eg plastic coated wire over the side and into the water to make a ladder, or when making a pond have a gentle slope to at least one of the sides. Keep ponds topped up, especially in hot weather so hedgehogs are less likely to topple in. Children’s paddling pools and sandpits are also a danger when filled with rainwater. Keep pots etc that might fill with water upside down. Provide a shallow dish of water for all visiting wildlife. Drains – keep drain holes covered: this stops both leaves and hedgehogs blocking the drain. Check uncovered drains, bean trenches, holes for footings etc and garage inspection pits daily to make sure no hedgehogs are trapped. Provide escape routes if possible eg rigid plastic netting or a plank. Fences – repair wooden fences that blow down in the wind etc as soon as possible or hedgehogs may be tempted to make their nests underneath them. Leave a hole in fences or newly constructed walls so the hedgehogs can come and go. Use environmentally safe wood preservatives on sheds, fences etc as hedgehogs often lick new smells or substances – your garden centre should be able to advise. Very occasionally hedgehogs are found with a leg trapped in between the gaps in log rolls (used for edging) so check these and other hazards regularly. 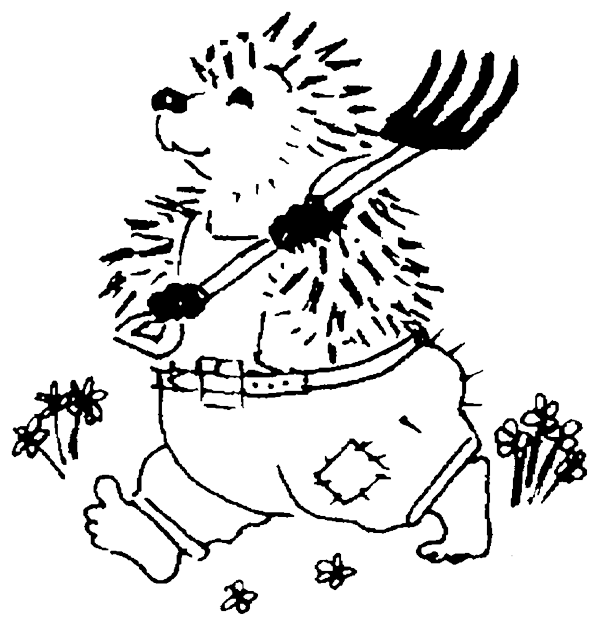 Wild Patches – STRIMMERS MUTILATE – take care when mowing long grass and tidying wild patches, as they are an ideal place for a hedgehog’s nest. When cutting long overgrown areas check for hedgehogs and other wildlife, then cut initially to about a foot long. Check again before cutting any lower. Providing a suitable nesting or hibernating box can help prevent accidental disturbance. Bin bags left at ground level will also attract hedgehogs and they may try to nest in them and get put out for the dustcart. Compost – another ideal place for a hedgehog to make a nest and rear its young. Take care when turning the heap; one thrust of a fork can easily kill more than one baby hedgehog. The safest time to spread the heap is probably Oct/Nov when most babies have left their mum and adults have not yet started to hibernate. Partly used bags of compost may also have nesting hedgehogs in them. Slug Pellets – try alternatives, REMEMBER METALDEHYDE SLUG PELLETS CAN KILL, if you must use them, use sparingly and pick up the dead slugs and snails as soon as possible. Read the directions for use before you use the product. Much better to use organic methods that don’t risk harming hedgehogs or other animals. Sheds – do not suddenly decide to keep doors closed which have previously been left open for some weeks without first checking that there is no nesting hedgehog inside. Keep chemicals, oil etc in both sheds and garages out of the reach of hedgehogs. We receive a lot of calls in summer from people dismantling sheds that find a mother with babies under it – so do take care or dismantle in October when the hoglets have left the nest and hibernation may not have started. Dogs – also share the garden with the hedgehogs. If you have a dog that you know attacks hedgehogs try to warn the hedgehog when the dog is being let out eg turn on an outside light a minute or so before letting the dog out. Also for the dogs final patrol of the evening you might consider putting him on his lead or using a muzzle. These precautions should only be necessary at night. You may notice that hedgehogs have their own routine ie they appear at a certain time from a certain point. If this is observed keep the dog in during those times. Not all the above suggestions will be practical for one reason or another but be aware of the dangers of some of your gardening activities and try to minimise these dangers. The above are ways to help visiting hedgehogs but if you want to actively encourage them into your garden you can provide food in suitable feeding stations and nesting sites (eg a pile of leaves in a quiet corner of the garden). Recent surveys show that hedgehog numbers are in decline so anything you can do to help them will be appreciated. They are particularly vulnerable in the autumn when they are fattening up for hibernation and extra food then can be a lifesaver. Feeding – to encourage a hedgehog to stay in or near your garden ensure it has a fresh supply of water available – especially in very hot weather – and leave a dish of hedgehog food, meaty cat or dog food or cat biscuits, in a place where the hedgehog can get it, but not the local cats (eg under something low). Visit our website for more details or write to the address below for more free leaflets. It is not advisable to take a hedgehog from the wild and put it into your garden nor to take one from your garden and re-home it elsewhere. If this is done and there are young they may die once their parent is removed. Finally if you do accidentally disturb a nest with a single adult hedgehog in it, replace the nesting material. The hedgehog can then either repair the nest or build another elsewhere. If the disturbed hedgehog is hibernating and wakes up, a dish of dog food and some water each night until it starts hibernating again would be helpful. If there are babies in the nest, again replace the nesting material, handling the nest as little as possible so as not to leave your smell on it. Keep an eye on the nest to see if mum returns. If there is no sign of her by the next morning telephone the BHPS for advice and a local contact. Do not allow friends, children etc to uncover the nest for a peep. If the mother has returned, she may abandon or even eat her young if she is disturbed again.